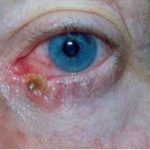 Eyelid Nodules and Tumors – M. Polly McKinstry, M.D. 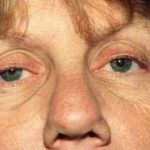 Eyelid nodules or growths may be benign or malignant as well as unattractive. They should be evaluated as soon as possible. 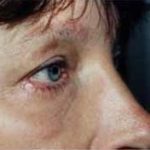 Small benign appearing bumps may be removed in the office in the minor surgery suite using local anesthesia to restore a more normal and attractive appearance to the eyelid as well as to obtain a biopsy to make sure there is no malignancy. 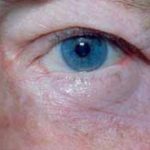 Xanthelasma are yellow cholesterol like deposits that form in certain individuals on the eyelids. 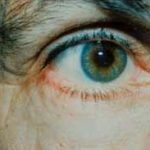 Although they may be associated with high levels of cholesterol in the blood, more often the patient’s blood cholesterol is normal. 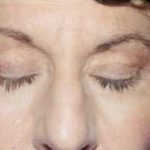 These can be removed surgically and the defect reconstructed using an eyelid flap or skin graft or they may be removed using the CO2 laser. 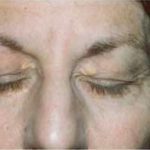 Malignant tumors of the eyelid should be completely removed before the eyelid is reconstructed. Complete removal is best insured using the Moh’s frozen section technique. In this technique, the tumor is removed and the edges of the portion that is removed are examined under a microscope using frozen section pathology which can be processed in approximately 20 minutes. 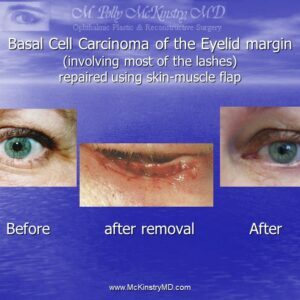 Additional tissue is removed until the edges of excision are free from tumor. This gives a 98% cure rate, meaning 98% of patients will not have any tumor re-growth. 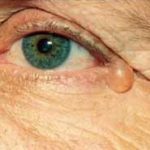 The removal of the tumor can be performed by a dermatopathologist, who is a dermatologist specializing in skin tumors. 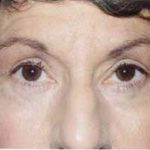 Alternatively, Dr. McKinstry can perform the excision of the tumor herself with the pathological examination of the tissues being performed by a general pathologist. 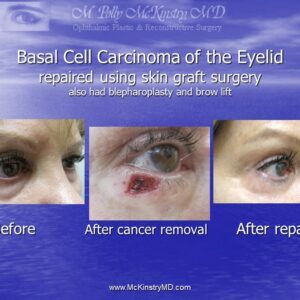 Once the tumor is completely removed, Dr. McKinstry will reconstruct the eyelid. 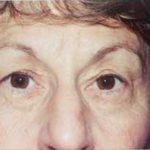 Eyelid reconstruction is a challenging and exacting procedure. 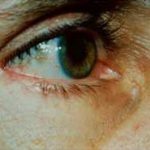 All levels of the eyelid, the mucous membrane lining, the support cartilage or tarsus, the muscle tissue and skin as well as tear drainage system must be reconstructed. 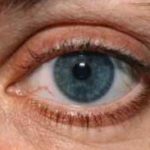 Dr. McKinstry has had excellent results in reconstructing a normal appearing and normally functioning eyelid. 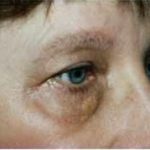 It is preferable to remove these tumors early before they have grown too large. Dr. McKinstry will perform regular examinations after the surgery. 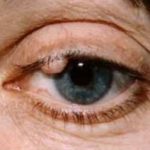 If there is a recurrence we treat it immediately while tumor is small. 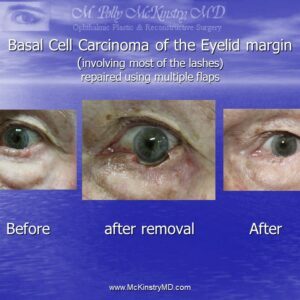 Once healing is complete, Dr. McKinstry performs an exam every three months in the first year after surgery, every six months in the second year and then once a year thereafter.